Meh. Bite me (with matching bratty little face and tongue sticking out)! Haha! Just kidding. I wouldn’t want to get fired. So anyway, let’s just pretend I do have a 9-5 job with a boss and HR department that aren’t killjoys. I’m sure they’ll end up loving this owl-print top as much as I do! I mean look at those owls! They’re so freaking cute! If you work at a more conservative company and bright colors aren’t really that accepted, you can always pair this with a navy blue or olive green skirt. Tan would work great too! In my opinion, people who dress happy, feel happy. Sometimes, what you wear can really set your mood for the entire day. So if you’re lucky enough to be working for a company that aren’t as strict with the dress code, I say go for some prints and colors once in a while. Of course I’m not saying you should wear neon to a meeting with the big bosses. It’s a given that you do have to consider your agenda for the day and who you’re meeting. If your agenda is clear and it won’t affect any of your meetings, brighten up your day why don’t you? Miss Cams, you look like a kid dressing up to forcefully become a lady! Ang bata mo kasing tingnan talaga eh! I hope you don’t mind me saying that..
heading to the corporate world soon hope HR boss is not a killjoy.hehe.your so pretty! Thank you Catherine! It’s my pleasure! SMGTW is love. :)) they`re just so pretty yet super affordable! oh myyyy. OWLS. I love owls. <3 they`re super cute. I have few things with an owl design on it. I`ll try to find a top with an owl design. and shoes?! haha. (blabbermouth mode on :D) if I were an office girl, I would definitely that kind of outfit with happy colors. as we all know, corporate attires are usually in dull colors like black, brown, gray. in short, dark colors. :D and yea, I noticed your pretty earrings. I just love its color (though I don`t like pink that much ;D). Hi Camille! What do you think will match with this skirt well to make it look casual? :) thanks! Camille… U’re always so well turned out. I really love how sophisticated u are. Big fan here! Thanks Suzanne! :) I’m flattered! Ohh. Sbe niu po kase may boss ka. Hindi ba ikaw ang boss ng sarili mu pong business? Your style is absolutely impeccable, as always. 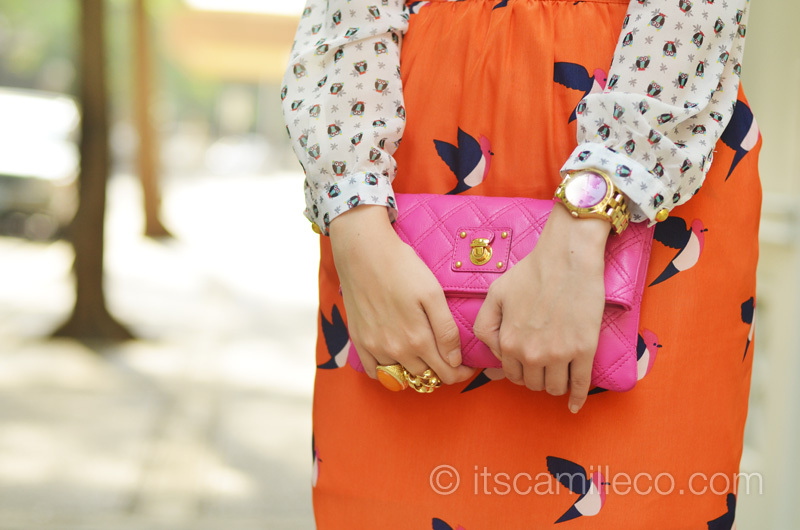 :) Love your blog, Camille! This outfit would so “fly” in many offices today. Love it! Haha love the play on words! Pero diba? These are so affordable! I’m an HR Officer and I have nothing against to this pretty and classy ensemble of yours. Thank you Ville! Your colleagues must love you for that haha! Hi camille. I like your berschka heels. Where did u buy them? Hi camille. I like your berska heels. Where did u buy them? I love bright and happy colors too! This whole look makes me miss to wear colorful outfit waaaa.. soon… soon. Really trendy but I don´t dare to mix print. Hi Camille!I saw you in Kris TV and when I heard you were a fashion blogger I’d thought of checking you out and I was beyond amaze with your posts.You are indeed a fashionista.The way you mix and match clothes truly is inspiring! Thank you Rea! :) I hope you come back for more! Thanks Dennise! Go for it!q Work towards your goal. You can do it too! Right??? So cute!!! Thanks Cathy! i absolutely agree with you! what style you pick in the morning can set up the entire day mood!^^ people should dress the way they want not what others says.self expression indeed is a good thing that lead to self confidence! anyway, hype the look! i sooo love your look especially your top and your shoes..sheer long sleeves,i really like them..i think i need to check Apartment8. Are they selling online po ba? yeah i think i need to start using them from now on..
fyi, u r my inspiration in the world of fashion..yay! ano ba yan, nobela na ata tong reply ko ah..hahaha..tc..
hi camille…you serve us an inspiration especially to us purchaser…thanks for your blog…we got an update here anytime…thanks a lot! What kind of lens do you use? :) And what settings do you use in your nikon? :) Ios, Aperture, and Shutter speed. Thanks Inca! Go lang! I’d love to! I love visiting your blog daily. Seriously it’s like a part of my daily routine. Anywho do you think Manila is gonna open a h&m? Hi! Just wondering where you get your hair colored (and what your hair color is) ’cause I really love your hair and I’m planning to dye mine this week. Hehe! More power to your blog and stay amazing! I’m such a fan of you and I’m looking forward to seeing you soon! Thanks. It’s hard to find that kind of skirt length… i need to hide my knees bcos of scars and stretchmarks.. Thank you April! Go for it lang! Haha eeeeeevil! :) Thanks CC! I was thinking of getting that too! :) Thanks Trisha! Hi Camille may I know what’s your work? Just a bit curious. all i know is your working in a fashion industry or also in a business company? More Powers! I love your top and this super pretty pink lipstick! Do you use Photoshop CS6? CS5? CS4? Student palang ako but I PROMISE, yes, promise talaga, pag-nag-work na ako, a la CAMILLE CO ang peg. Kahit na i-fire pa ako ng boss ko, fashion has no rules eh! Anyway, we’re going to have our educational trip sa museums sa Los Banos and sa Mind Museum. :) Since our school loves us, civilian clothes lang pero dap at naka-pants and closed shoes. Can you suggest what to wear? Thanks! And also may gusto along suotin na ballet shoes (foldable sya na may snakeskin print), nag-fit lang sya sa akin kasi garterized yung end part nung flats kaso medyo obvious pa rin na di talaga kasya sa akin, what could I wear or place sa shoes para it would seem like they really fit? Tissue ba? Chos! THANKS! Hi camille! Love ur shots and ur look! Btw, what white balance do u normally use? Did u buy an adobe photoshop online? Last question, who is ur web designer? Im planning to redesign my own site. Oh she doesn’t design na kasi. She just did this for me :) So sorry! How do you keep track of the brands of each of your accessories? Most naman kasi don’t have labels on them eh. Blog na kasi about your closet eh! :D Kahit your shoe closet na lang ;) haha! I don’t know too! For the new ones at least, I put labels on them :) So hard to document my clothes and shoes!! ting! (light bulb!) will try this look! hehehe! “As for me Miss Camille, your outfit is like saying “Hitting two birds with one stone”. Wow i really love this outfit dear! I used to dress up like you do. Some people like it but some not. But i don’t care, i dress what i want to dress. And this is going to be my inspiration! I love the pretty skirt! We dress for ourselves! :) Thank you! pag-iba ang nagsuot ng ganyang skirt, pwede ng tawaging miss tapia or manang pero pag-ikaw, glam pa rin! Haha ganun ba? :) Thanks Emmrose!